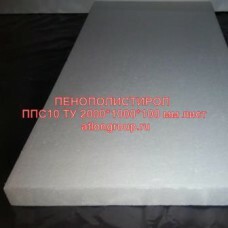 Insulation for internal insulation of surfaces 200x100x10 cm. Brand PS 10 TU is great for insulation from the inside. The thickness of 100 mm is good to insulate the house with capital walls or contributes to the sound insulation of interior partitions. When isolating the walls from the inside, do not forget that this thickness will significantly reduce the area of the room. We will provide discounts for wholesale purchase. Price per piece: 280 rubles.